About step 7-9 (forget which 1), it only write about choosing the patch file, but didn't say apply. (I was stunned where for a while, directly open the next program without clicking apply, then soon realise). The picture of charactor mod is nice, where is it from ? Will try out more until the end, FF7 is the best. I imagine you would have to apply. The character pictures are from some random artworks I had on an old harddrive from many years ago. Hope you enjoy the mod. Could you improve the sephiroth as well ? But its nice skill you have there ! I just wondering is there any guidance on skill's attribute (fire/water/ice,etc) What is laser's attribute (non-elemental ?) I just found an empty blue materia, which have no content, I found it only FF7 Rebirth too. Are you onto any other projects ? Edited: You further play, found that not only the dragon.... everything have upgraded except sephiroth ? Take very long time no go through the flashback. Are water meant to have 'slow' effect ? It has slow description using water materia. Add Effect also had some uncertainty that which I need to ask you whether is it intented. About the Flashback. The enemies come from the Mt. Nibel scene data, which means they are quite a bit more powerful than they used to be and also much more powerful than you. 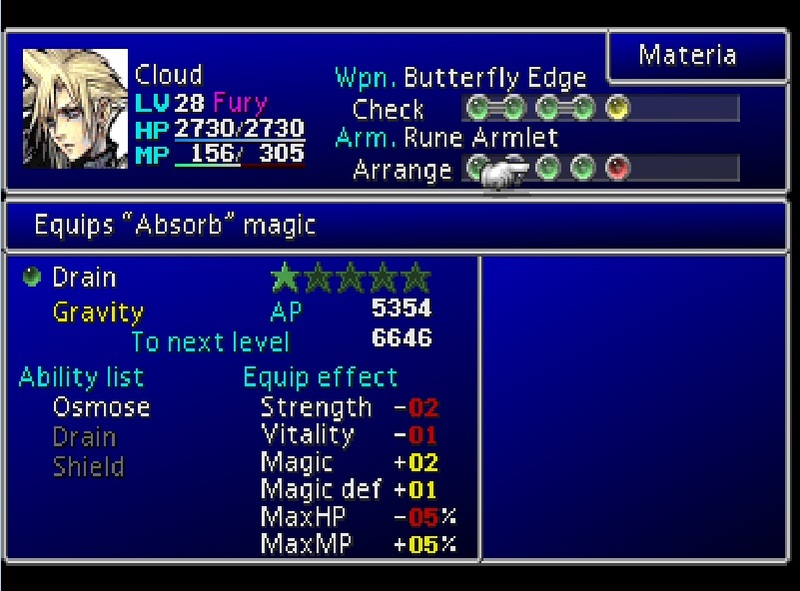 If you are using codes to control Sephiroth and Young Cloud, then they could potentially have gained levels and equipment. I also used codes like auto-limit break and ATB always full during this part of the game. If you are not using any codes, then your Sephiroth and Young Cloud will be very weak compared to the enemies in the area, but Sephiroth is invinsible, so you will not lose any battles. Sorry if this has caused it to take a long time to make it through the flashback - in my playthrough I had used Sephiroth and Young Cloud prior to the Flashback so they were able to put up a fight. I can't remember if those status effects are what I intended. 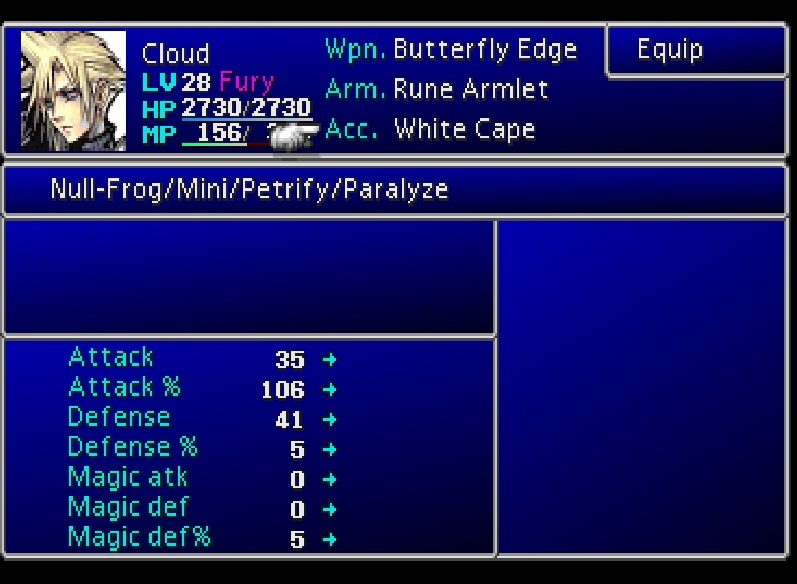 I think that I gave many of the enemies multiple status immunities, so those status effects probably only work on most weaker enemies. 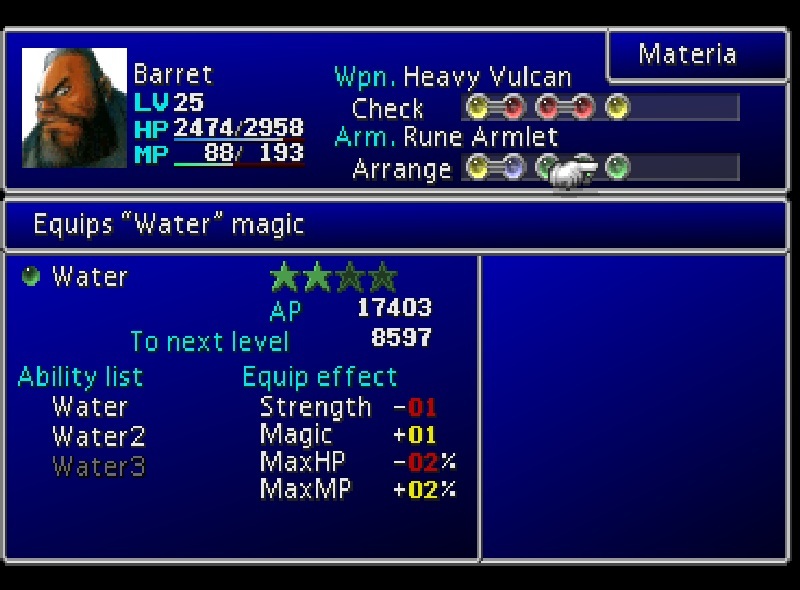 Holy, Water, and Wind Materia should have an elemental effect...I remember that that worked when I played it. Laser has the 'Shoot' elemental property. Like Barret's and Vincent's guns. Some other people have reported finding that blank support materia. I think it is useless, but you could try pairing it up with Added Effect or Elemental and see what happens in the status menu. I didn't use any other modding, and no code as well (original !) But maybe the sephiroth need to be strengthen to make the game proceed faster. Extra : The level of materia some are a bit off (not same as normal), which they have more/less level to master. Normal materia have one more level after all spell obtained. (Water1 > Water 2 >: Water 3 >Mastered) But 'Restore" have one extra level (because removed cure3 ?) and "Support" have one less, which get speel and master at same time (Haste>Lcky Strike> Wall>Madness>Might+Mastered) Does this have any problem or it is intended ? 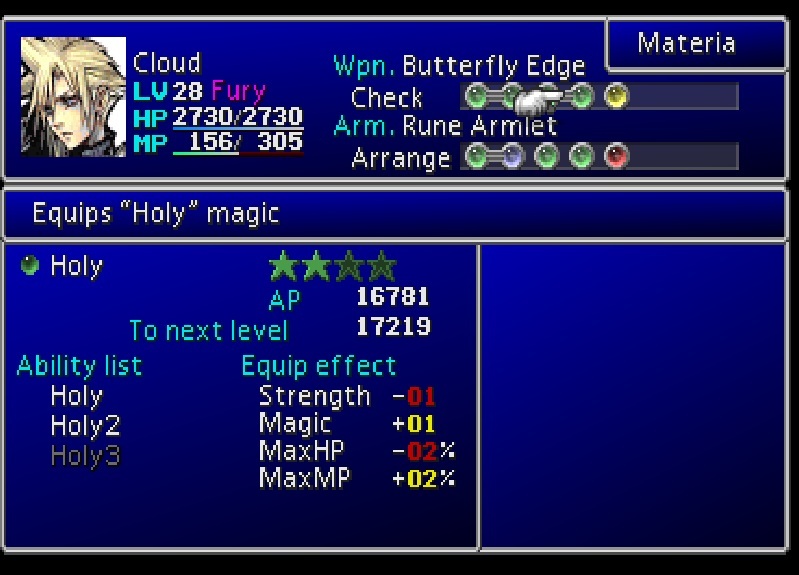 About element problem, I have tested with elemental support materia, which not shown in the "status" menu. Had some picture attached here shown above occurence. I just finished the first disk. But when I'm going to patch the 2nd disk, it got some sort of error (binblock/patchvalidation failed). Same error goes to 3rd disk, did you ever tried making it to 3rd disk ? EDITED: sorry, I just mis-look the instruction. Just to let you know, the 1st method is not applicable to disk 2 & 3. And its quite a long job to import all those files, is there way to make another patch that 'conveniently' apply to the file that will help others to instantly convert the game ? Hi there LostWing! As I told you, I'm here (I commented you on youtube remember?) I've been taking a look on mods, and I see you have 2 FF7 mods: Lost Wing and FF7 Revisited. Are those 2 mods the same, or just different ones? 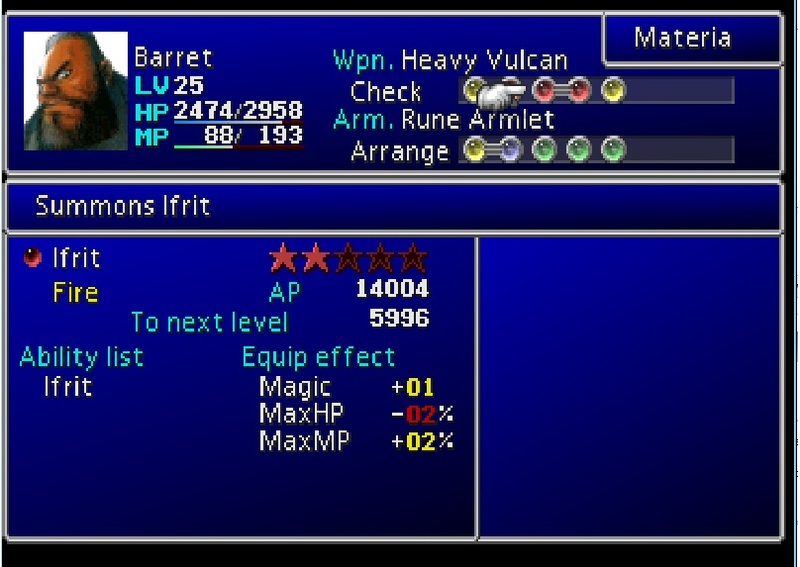 If you try using the Elemental paired with those materia and check the 'Status' menu (not the Equipment menu) the Elemental Property Should be Applied. If not, then I guess it does not work. If the method in the instructions does not work for patching the other disks, that is unfortunate, but once you know how to patch a disk, you should know how to patch the others. Glad you figured it out. Just to be clear, I am not working on this mod anymore. I've mentioned it several times in this thread, but this was essentially practice for me. I initially made it for myself, but people expressed an interest in playing it so I made it available, flaws, bugs, and all. Please continue to post about the mod though, hopefully it will help future players. @JeMaCheHi - LostWing and Revisited are different. My youtube videos illustrate some of the differences, and if you read the threads for each mod you will be able to get a better idea about how they are different. Also, only a short demo is available for Revisited right now, but I was considering releasing the updated version that I have. Unfortunately, I don't think that the PSP conversion will work properly. Others have tried unsuccessfully to convert my mod for use on PSP, and it is very flattering, but don't get your hopes up. Good luck. I've tried it... unsuccesfully u.u It freezes when you're fighting, or when you open certain menu sections, i.e. Items or Equip. Tried with several versions of POPS so I think that's not the problem, or at least, all the problem. Have you got any suggestions about it? Don't you think that playing those mode everywhere would be amazing..? I don't know why specifically, but I imagine it is because Ive modded a massive amount of data. There has been some disucssion about what mods might be possible for the PSP. But there are no tangible products. If you are willing to test, you might be able to see what PSP mods could handle. It would involve a bit of work. Up to it? I've got a problem cause i don't really understand the instructions. when you say "In the 'Patch' field open 'KernelPatch.ppf'"
Are you talking about KernelPatchv2.ppf in the Lost wing folder? If yes: i've got a bug (PAL version) I do everything in the instructions, but after the "Sony entertainment Presents" the screen stay black. If no: can you explain it to me for found the good patch, or does somebody can send me his FF7 iso by private message? hhhhmmmm sorry to post this on two different topics but is i tried the PSX version of this mod on my PSP through a few versions of POPS and at some places the game freezes my PSP off. is it supposed to work on the PSP or isd this ePSXe only? If instructions refer to "patch" and you find a "pratchv2" use it. Really?cause i thought this could work on the PSP via 3.71 POPs though if i can find the right ID to use for this mod when converting it to EBOOT.. If so, I have a problem I need to ask? I tried installing this mod, but the game freezes when a try to select a Menu option. (i.e. Item in the main menu or Magic in battle). Does anyone know what I can do to fix this? Where did I mess up? I think it's PSX NTSC 1998. The us version on the PS1. I'm also on Linux running PPF-O-Matic3 and CDmage through wine. 175,000 Youtube views for my Lostwing videos Anyone play this at all anymore? I actually don't know if I ever beat it myself lol. Haven't had anytime for VII in a long time. Well, if anyone has played through the whole game and knows the biggest issues with the mod, post them here. If I can fix a few major things, then maybe this thing could feel a bit more legit. Im playing it every now 'n then on my phone. Quite balanced so far, even though i'm having trouble in the Sector 5 slums.. but thats because the controls are a bit clunky. So it takes longer then usual till i'm even a BIT into the game. How come Cloud, Sephiroth, and Young Cloud do no damage to the shinra soliders at all? Is there a bug on that? If you mean the MPs in the First Reactor...They just don't get hurt by swords. Some enemies do not take damage from specific types of attacks. If you mean other soldiers and SOLDIERs not getting hurt by anything that any of those characters do, then something else is wrong. Oh okay. Thanks. They take damage but just not by those 3. In the beginning and when they break into the Shinar CO. I havent played pass that yet. Hey man, I love your mod! 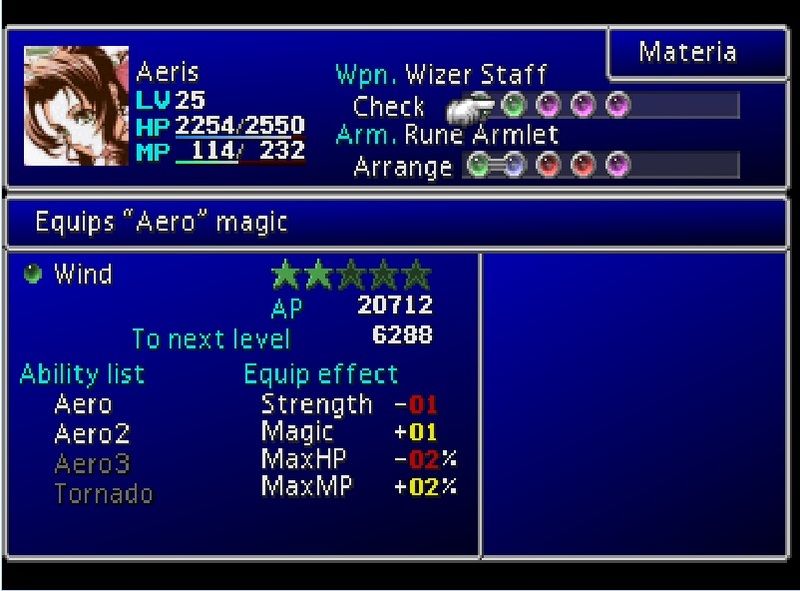 It adds the older Final Fantasy feel, with all the new materia and the status bonuses on equipment and such. I'm playing through now, and I know a load of my friends are - I'd love you to keep working on this!